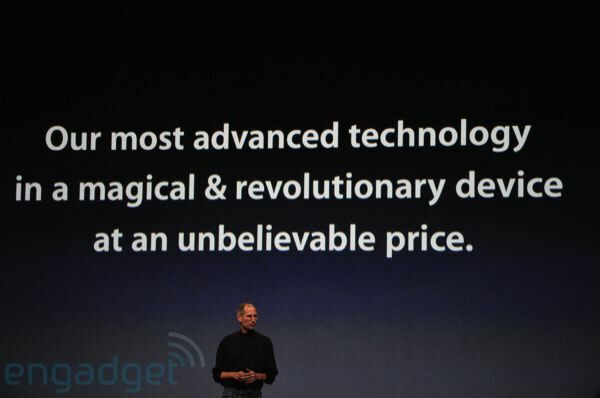 Apple's iPad is a "magical device" … really!? Now, go to http://www.apple.com/ipad/ and click on the “watch the iPad video” link. See any similarities? I kept waiting for Jobs to say something like, “haha just kidding, did you really think this is why we gathered all of you here today?” … except he didn’t. They’re completely serious about it. The apple.com home page says it is a “magical device”. Magical? Really? Unicorns and wizards are magical. They’re fun, but also fictional and nobody* actually takes them seriously. That image is not edited with Paint.NET or Photoshop — they really had that slide up! I’ll skip all of the obvious feminine hygiene references and jokes. It’s a really big iPod Touch, and it has some wickedly good looking, and probably even well-written, UI. But it can’t multitask. It doesn’t have a webcam for video calls. You still need a full PC/Mac to sync with. Apple, while publicly dissing them, has completely missed the point of netbooks: they are very cheap, and you can use all your existing stuff (apps, data, and devices) with them. If you drop it or lose it or break it, it’s not a big problem for the most part. Netbooks aren’t new or revolutionary devices: they’re simply a new price point. I don’t believe that people want a third device. It isn’t something I would want to use everyday … why would I pay $500+ for it? Why would I buy a $30/month 3G data plan for it? Why should I have an iPhone in my pocket, and both an iPad and MacBook (or whatever) in my backpack? If I have a laptop and an iPhone, then I don’t need an iPad. eBook reader? It’ll honestly be really good at that. But at a minimum of $500, I’d rather get the Amazon Kindle (it’s what, $200?). Or, and this is my personal preference, I’ll just buy the paperback for $10. I guess I’m old fashioned. Then again, my book shelf has been filling itself with books on physics and cosmology lately. Taking notes in class? Except you still need a PC/Mac to sync with, and college kids don’t have oodles of money to throw at these things. So, I think they’ll skip it and just get a laptop. And there’s no stylus for free form note drawing, which I personally would need for any type of mathematics. Can I plug it into my Mac/PC to use as a drawing tablet? Nope. How about a Remote Desktop terminal so you can hook up to your main desktop/workstation while at the coffee shop or wherever? Sweet. A native iPad Remote Desktop app is very plausible. Except you have to buy a keyboard dock at that point, and you still won’t have a mouse. Why not just use your existing laptop? Or buy a $250 netbook? A really big remote control for my home theater PC? Too expensive. Could be cool though. How about docking it to my PC to use as an additional monitor? Nope. Gaming! That must be it! Except I already have an iPhone. And an XBOX and a PS3. I really don’t need to play geoDefense on a larger screen, or Mass Effect 2 on a smaller one. The list goes on and on. There’s nothing I can do on my iPhone or PC (laptop or desktop) that I can do better on the iPad. Nor is there anything the iPad can do that my other devices can’t. It’s too expensive, and there’s really no killer app. It does, however, have beautiful software, so I would like to give kudos to the software engineers who’ve worked on it. I just don’t see the point. I’m still hoping for the “just kidding!” slide. I think they should’ve just extended Mac OS X to work better with a touch-only interface, and to scale down to even lower-end hardware. Add an iPhone emulator and extend the AppStore to Mac apps. Tada … I think that would sell. * ok some people do … maybe they are the target market for the iPad? 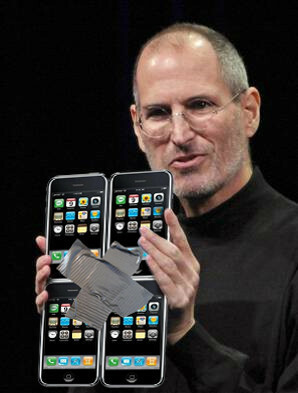 Regardless of any of that, it will do well just on the basis of being another status symbol for the Apple fashonistas. Nik, I’m not actually convinced of that either 🙂 It could be the first true Apple product failure for the new decade! I personally was amazed that it isn’t widescreen. They are one of the main companies that started pushing widescreens, and then the iPad is the most common standard resolution in traditional monitors. Very strange. Also, did anyone else think the calendar app looked quite a bit like the Courier mockups? I’m also not sure why they decided to make the iPhone bigger, when it would’ve been much more useful if they’d made a regular Mac *smaller*. At least they could’ve kept the phone-calling ability of the iPhone (or did I miss that?). Perhaps a bluetooth headset and the iPad in your backpack means you could’ve actually left the iPhone at home? Well no, not really. Today’s e-books have battery life of days not hours, they are lighter and they have much higher contrast screens, which helps reduce eye strain (one of the main reasons we still don’t have the paperless office). I like your article, it’s right on the money. All that I hoped the “ipad” could be, it’s not. So disappointing..! I watched the video (from http://www.apple.com/ipad/ipad-video/#small because the link on the main page didn’t work for me) and I wanted one, a first for any apple product. Ever. Then I came back here and read the rest of the article and I don’t want one any more. I do, however, think it will sell. People will buy it because of the hype, and keep it because they don’t want to admit to making a $500 mistake. Multiple apps open at the same time and a camera and I would be sold, but only if one of those apps is firefox. The Kindle DX which has the 9.7 inch screen is $489. If it were not for all the tablet rumors I probably would have bought one. They have apps for taking notes that sync to the could. Google docs works well. You will be able to use it as a drawing tablet. iPhone has had remote mouse apps for a long time. iPhone also has had good free remote desktop apps. I like the iPhone keyboard. They have apps for tv control. Apple made one with for their TV box thingy. Limited by hardware really. Additional monitor would be cool. There will probably be apps for that. I kept by the radio for updates. I heard the news “breaking” on the hour. Then nothing. I kept wondering where the cool stuff was. This is a i-device, it’s meant to ooze cool! It doesn’t. I’ll buy a Kindle for half the price. The capacative screen is developed together with wacom, so it might be pretty precise and useful. @J. Langevad that’s very tempting, but at double the price of the ipad probably not going to be on my shopping list for a while. Although that video was released a long time before the iPad was announced. It has an Apple logo, people would buy it if it were a shiny turd. Now, Apple always have a unique way technology: One day its advertisements pester Intel processors in favor PowerPC and the next day it’s announcing new Macs: Intel Inside! Oh, and remember that mouse without a button? Now, iPhone seems to be very popular in U.S. but not in Europe. But, apart from that, this iPad things seems to be Apple’s unique approach to Tablet PC. I myself only have a ipod touch, but i would like to have a iPad for the 3G for when im out and about, and also if it had a paint.net app. i reckon that would be sexual. i also think the jailbreaking community will do wonders with it. but im still not fussed over the ipad, as i can already do all the things with my touch and laptop.